Southern Minnesota Skydiving opened for business at Le Sueur Municipal Airport on May 15, 2010. Dr. William Lee of Blue Earth began seeing potential in developing a niche market in southern Minnesota: Lap-Band surgery for weight loss. 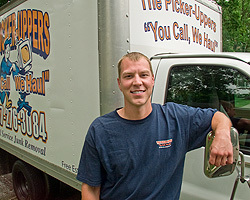 The Picker-Uppers owner, Justin Keech, learned a lot from his mother, Sue Rothmeier, a New Ulm RE/MAX real estate broker. Forget nine, Curt Fisher has nine hundred lives. He has badly wrecked a BSA motorcycle, lost altitude and crashed a power parachute onto a Blue Earth County park pavilion, navigated the dangerously rocky Blue Earth River perhaps hundreds of times on a jet ski, sailed across the rough Atlantic Ocean in a sailboat, and barely survived his antique steam engine flipping over before a North Mankato parade. And we’re just getting started. This could be Greater Mankato’s most breathtaking and peaceful panorama of the Minnesota River Valley. Soothing classical music from Bach and Beethoven to Berlioz on KGAC-FM glides around workstations and faintly filters through hallways. Twelve employees—and the only sounds they create are whispers and feather-light keystrokes. What if employees looked forward more enthusiastically to the start of the workweek than to weekends? What if “TGI Monday” became a national slogan? What if all workers looked forward to working 80,000 hours during their lifetime? If so, Sara Christiansen, founder and vice president of New Ulm-based Ideation Consulting, might have to develop a new career. When I set up shop as a graphic artist, I never thought about the cyclical nature of business. It didn’t take long, however, to learn there is a natural ebb and flow to every type of business. I became accustomed to a cycle of slow summers and insanely busy winters. 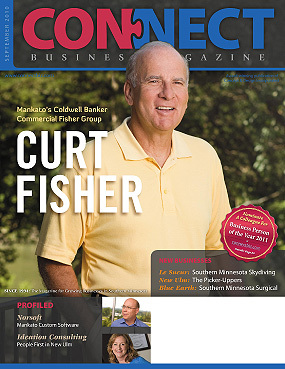 Starting Connect Business Magazine was, in part, a strategy to modify that cycle and help my design company tack through the doldrums of summer.